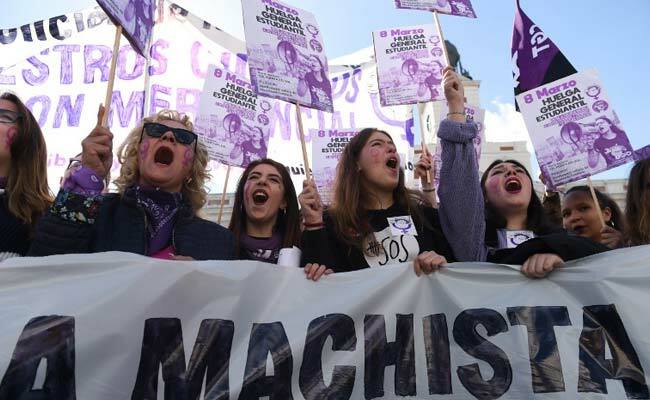 Madrid: For the second year running, Spanish women went on strike today for International Women's Day, with several protests kicking off over what has become a hot topic in the country's election campaign. "If we stop, the world stops." Armed with this slogan, Spain's largest unions CCOO and UGT organised a two-hour work stoppage -- the first starting at midday -- while smaller unions have called for a 24-hour strike. Madrid Mayor Manuela Carmena, prominent journalists, nuns and company employees are among hundreds of women who have pledged to take part in a strike that seeks to recreate an unprecedented two-hour work stoppage that took place on the same day in 2018. It was as yet unclear how many women were participating. International Women's Day is being celebrated around the world today, with marches and other actions expected. Hundreds of protests and gatherings are planned across Spain. In Barcelona, demonstrators blocked a major thoroughfare, some wearing purple wigs -- the colour long associated with gender equality. Unions, feminist associations and left-wing parties are hoping to draw hundreds of thousands of people in big marches later in the day in Madrid and Barcelona. As snap general elections near on April 28, women's rights has become a crux theme of left and right-wing parties' election campaigns, with all pledging to do their bit for inequalities. The gender pay gap stands at 14.2 percent according to the latest EU statistics, two points below the EU average. And gender violence continues to take its toll on women, with 47 killed by their partners or ex-partners last year and at least 975 dead since 2003, according to government figures. "Us women need to be seen, because there is still a lot of work to do," Ana Pastor, the conservative parliament speaker, told Spanish television. "Women don't have real power." Prime Minister Pedro Sanchez, who has made women's rights one of the central themes of his campaign, tweeted that he wanted "a feminist Spain." "Only with feminism will we end violence against women and achieve real equality," he said. Spanish media is awash with stories about women's rights and gender inequality. On Thursday, the national police force announced it was working on a "non-sexist language guide for its agents." But there are increasing dissenting voices against what some conservative groups believe has gone too far. The conservative Popular Party won't take part in the Madrid protest, considering the manifesto that called the demonstration "unacceptable." This calls on people to mobilise "in the face of the right and far-right that have placed us women and migrants as a priority target of their ultra-liberal, racist and patriarchal offensive." 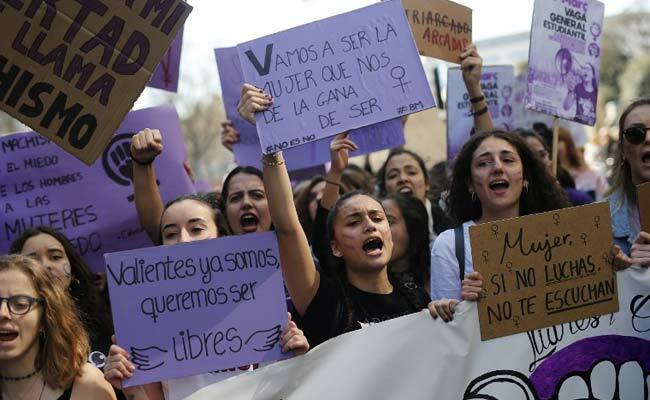 Centre-right party Ciudadanos, meanwhile, has lashed out at what it considers an attempt by the left to appropriate feminism to get more votes on April 28 general elections. The "Women of the World Global Platform," a Spanish initiative that groups together conservative associations from around the world, has also called for a counter-protest in central Madrid on March 10.
International Women's Day "has converted into a day for those who reject femininity as well as masculinity, complementarity, maternity and dedication to the family," spokeswoman Leonor Tamayo said in a statement. Small far-right party Vox, which opposes a law against gender violence that it feels is "ideological" and "discriminatory" towards men, has also been gaining ground. Pastor, though, retorted that "this is not about parties." "There are thousands of women in Spain who don't vote, who don't identify with parties... A day like today is more about speaking as people, above all as women."